There is more to kayak fishing than just casting. Kayak fishing is very popular around Jersey. Sit-on-top kayaks enable you to get afloat easily. Explore the coastline, chill out and (hopefully) catch supper! There is more to sit-on-top kayak fishing than meets the eye. It is not the same as fishing from a pier or a boat. 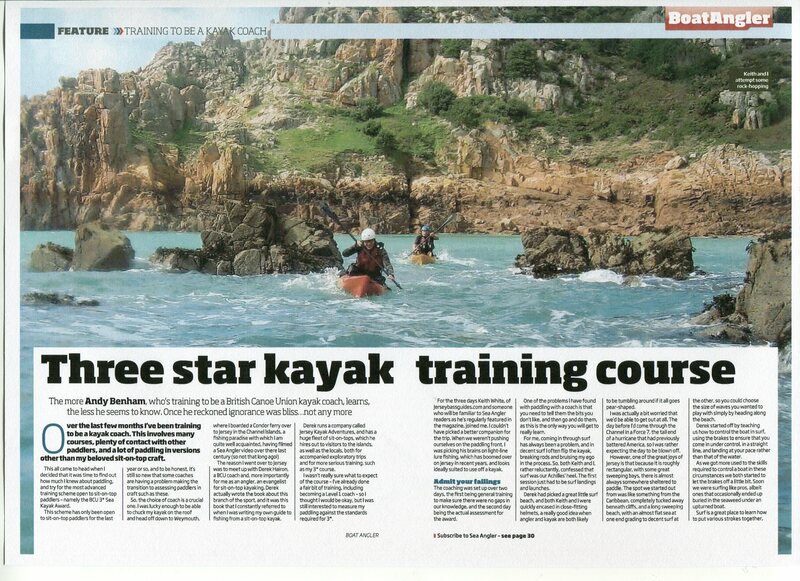 Nor is it the same as just sea kayaking, so it is a good idea to get some training. If you have no experience of kayaking or fishing it is best to learn each discipline separately. We can offer both introductory kayaking and fishing as separate elements. Email or phone to discuss. If you have kayaked before or have done a bit of fishing, this session will give you an insight into the advantages of sit-on-top kayak fishing as we fish a few spots around the coast. 3-hour sessions with all kayak kit and basic fishing gear (including lures) supplied. £124.50 for up to two people in your party. Contact us for dates. Advance booking is essential. This one day course covers essential kayak techniques for users of sit-on-top kayaks who plan to go kayak fishing or, are already kayak fishing and want to learn and practice key safety skills with our expert staff. All equipment is supplied along with a selection of Sit-on-top kayaks to help new paddlers get a better idea of which design is best for them. 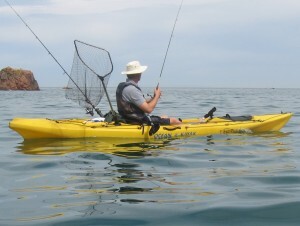 Kayak fishing safety training can include the use of rods, anchors and fishing gear. Practice capsize and rescue skills with fishing gear on board. BC syllabus and course outline. Learn Sit-on-top kayak paddle skills at one of the first centres in the UK to embrace sit-on-top kayaking. Director, Derek Hairon, is the author of Sit-on-top kayak, a beginners manual. Learn essential sit-on-top kayak safety and techniques from some of the most experienced sit-on-top kayak coaches in the UK. Our courses are designed to teach essential skills while you explore the fantastic coastline of Jersey. Try a selection of Sit-on-top kayaks during the course. There is a huge range of sit-on-top designs on the market and attending our course will give you a better idea of which design is best for you. Visit our Sit-on-top kayak courses page for our evening and weekly classes. It is often possible to run courses and private coaching on other dates. Our What Sit-on-top kayak to buy page will give you advice n the choice of equipment. Visit our Courses page for dates. It is often possible to arrange custom dates for short courses. Email or call 07797853033 to discuss your needs. Manual included. All equipment and wetsuits supplied. Optional drysuit hire is available for £5 per class. Wrasse are sometimes called “Pig fish” because they can fight like pigs! 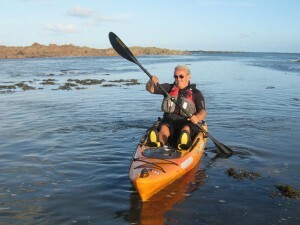 It is now possible to take the British Canoeing (BC) 3-star sea award using a Sit-on-top kayak. This course is ideal for the Sit-on-top kayaker who wants to develop their skills to get out more. If you kayak fish this 2-day course helps you develop your paddle skills to get to fishing spots you might otherwise not reach. The course covers essential safety skills, improving your paddle techniques, launching and landing your sit-on-top kayak in the surf. The use of anchors can be included if required with a focus on key safety issues. Read about Andy Benham’s (author of Discover kayak fishing) 3-star course. Read Andy Benhams’ article in Sea Angler. Two days is recommended but this does depend on your skill level. This 1-day assessment will consist of a day-long coastal kayak trip. For the Sit-on-top kayaker who can only attend on specific dates or wants 1:1 coaching for the BC 3-star award. Special two-person private class offer: £220 per day. *Note: If you combine training and assessment courses together it is important to understand that attending a training course does not imply that you will reach the required standard to pass the 3-star award at the end of the training. Much depends on your level of paddle skills and experience. If you wish to combine training and assessment into two or three days please discuss this in advance. 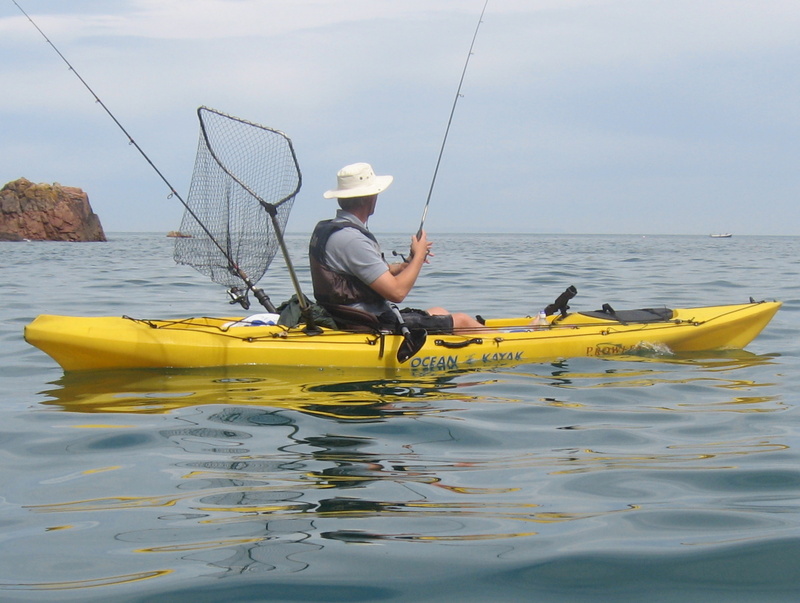 Tides, currents and weather can have a huge impact on your kayak fishing trip. 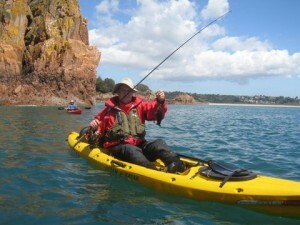 This 1-day course aims to cover essential skills to enable you to plan your kayak angling trip. We cover charts and look at how tides, weather and seabed will have an impact on conditions and likely catches. This course can be added to courses and also run on demand. More information is here. If you have a group who want a specific course give me a call as it may be more effective for me to come to you. Email or phone 07797853033 to discuss.